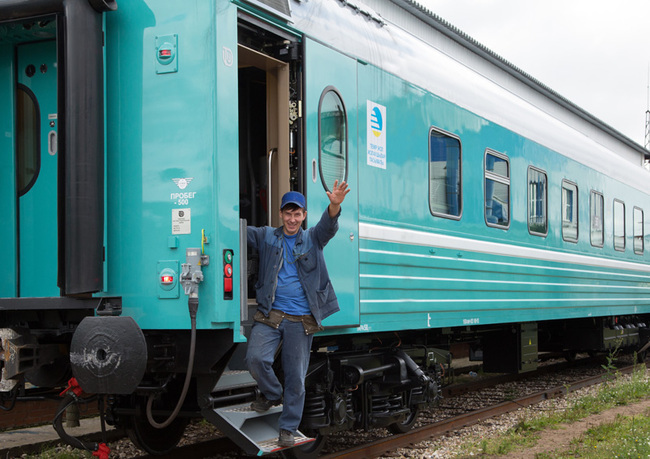 18 cars — 13 compartment models — 4440 and 5 second-class models — 4447 Tver Carriage Works produced for delivery to the foreign market — they are designed to Kazakh Railways. Customer of the rolling stands "Passenger railcar leasing company." By design cars for Kazakhstan produced little different from the SEZ for JSC "Federal Passenger Company", but still have a number of features. In particular, according to the agreement upgraded sanitary and technical module, placarded on both sides of the car, redesigned door. Another striking difference — Color: outdoor painting of cars manufactured in accordance with the design solution zakazchika.Etot project is very interesting for the Tver Carriage Works. In the face of declining orders from the JSC "FPK" it provides an increase in the production load and gives the opportunity to take the TVZ with their products to the CIS market, where the issue of renewal of the rolling stock is quite acute. According to the commercial director of JSC "SEZ" Andrei Shishkin, in the case of successful operation of the first 18-minute wagon factory will be able to participate in the tender for the production of more than 50 cars.